A thermal label is made of a synthetic material and coated with a varnish making them the most durable companion labels available. The combination of synthetic materials and varnish makes them impervious to chemicals and fluids. Thermal printer's generate a crisp, clear image making them ideal for printing barcodes, graphics and text. 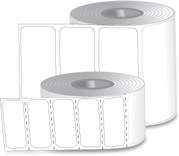 A thermal printer is small in size making them ideal for areas with space limitations.